Geo Bieler Sons Cincinnati Brookfield Rye. 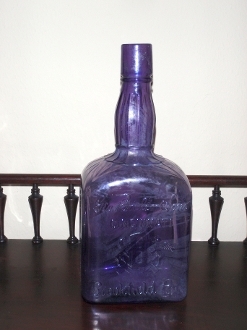 Blown glass rye whiskey back bar bottle style, with embossing as follows ( Geo Bieler Sons Cincinnati Brookfield Rye ) with a fancy neck and heel, purple in color, blown glass , measures 10 inches tall, this bottle is in excellent dug condition with the clouding of a dug bottle. Also has the bubbles in the glass typical of this period. Circa 1880-1910.